How would it feel to do something different this year? There are lots of little things you can do to reduce your stress and feel more connected now. Friends are one of the most important things we can have in life. Connecting with others creates a sense of belonging and purpose that we all need. Having someone to laugh or relax with naturally reduces stress levels. If you’ve been feeling lonely or isolated try something as simple as sending an ‘I’m thinking about you’ note or text to an old friend. There is some truth behind the saying ‘Warm Hands Warm Heart’. Several studies have shown that holding something warm or having a hot shower creates warm fuzzy feelings on the inside. For an added boost of calm try adding some lavender or lemon essential oils to your next hot shower. Tis the season to be merry, but there aren’t many things more stressful than waking up after the office Christmas party wondering ‘What the hell did I do last night?? !’ You don’t have to be completely abstinent, but cutting back can help you feel better. Need a delicious alternative? Try this amazing Grapefruit Rosemary Fizz. It’s so good you won’t even miss the alcohol. Helping others who are less fortunate is also gift to yourself. Giving back creates a feeling of connection and can boost your self-worth. Find something that is near and dear to your heart and go help. Find an event, go take a walk and look at the lights, put on a movie you’ve been wanting to watch. Give yourself permission to have a good time. Having fun and laughing is one of the best things you can do to reduce stress. Gratitude works and the benefits are nearly endless. Focusing on gratitude over time changes the way we see our lives. Over the next few days write down three things you’re grateful for. It can be something you appreciate or situations that went well. If it’s good, make a note. 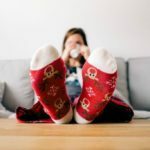 This will help you have more joy this holiday season and train your mind to see more positive things in the coming year. Wishing you a Calm and Joyful Holiday!